Lidia and I have read so many of the comments and testimonies in the wake of Stuart’s death; all of them striking so many different chords, sounding out such a vibrant and irrepressible legacy. I suppose working and living here in southern Italy, outside the immediate circuits of the anglophone and North Atlantic world, I would perhaps simply like to recall some of the wider resonances of Stuart’s work, words and life. After all, Stuart came with what Derek Walcott famously described as a ‘sound colonial education’ from the edges of the empire. 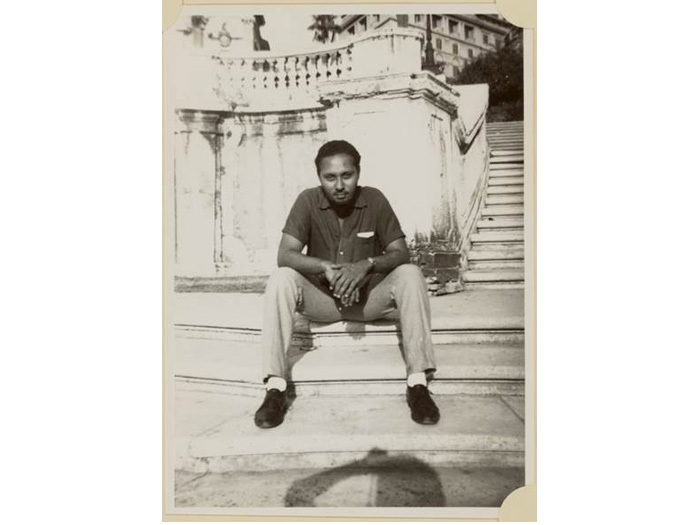 He was from the Caribbean that was also the home of C.L.R.James, Aimé Césaire, Frantz Fanon, Édouard Glissant, Bob Marley and the creolising procedures that crossed politics and poetics in new configurations. Such a journey from the perceived periphery of the metropolitan world, had necessarily to disturb and radically rewrite the intellectual script while redrawing the cultural map of being ‘English’, British, European and white. It was inevitable, like Fanon, Assia Djebar, Edward Said and even Jacques Derrida, that he would reshuffle the cultural pack he had been handed by colonialism and the culture of the ‘mother country’. For while Stuart was deeply committed to capturing the profound political sense of British culture and its everyday life, his cultural itinerary was also and always an undertaking that was nurtured by his roots/routes from elsewhere: beautifully captured by John Akomfrah in The Stuart Hall Project (2013). Offspring of the violent colonial formation of the Caribbean, of a diaspora initiated by the Atlantic slave trade and subsequently legitimised by an imperial order, his critical gaze unavoidably had an oblique edge that cut into and across more provincial, home-grown, understandings of the historical and political powers exercised by metropolitan culture. While many of his intellectual influences have been mentioned – including his tussles with Althusser and Foucault and his enveloping them in a Gramscian-inspired understanding of the culture of power, and the power of culture – there was always this deeper current that flowed through Stuart’s critical attention. To suggest that this critical heritage haunts his influential pronouncements on race, identity, politics, nationalism and the black arts that he did so much to foster in his later years is to understand why Stuart was never merely an academic or a scholar with a private biography. To use a phrase that these days sounds wooden in English, he was a committed intellectual. His intellectual militancy was tied to understanding the complex making and mutations of the modern world. As a pioneer of trans-disciplinary thought and research his work was destined to travel far afield. It laid the foundations for transnational itineraries – from Naples to Shanghai and Buenos Aires – like unauthorised blue lines traced over the globe by his beloved Miles Davis. The critical cut his work operated on the body of British (and European) culture has provided and provoked another set of coordinates with which to map, navigate and negotiate a world that is now irreducible to the concerns of London, Paris, Berlin or Washington. In his detailed understandings of how the British Empire had fallen in upon the centre (that is, of how the ex-colonial world has fallen in upon the West), Stuart opened up a critical path in which the particular and the planetary increasingly resonate in a political scenario that we have yet to understand in all its consequences… that is, if we dare to follow him into what he always considered to be a space ‘without guarantees’. As to me I cannot but recall Stuart’s sunny face when I first met him in 1964. He was starting his work in Birmingham, and I was a newcomer to the Centre with a copy of Gramsci’s Lettere dal carcere, not yet translated into English, and there to carry out research on English working class theatre. In spite of being by then far from his previous concerns with literature and theatre, Stuart showed interest and offered guidance as the real educator he was, though of course Gramsci was far more interesting for him. We were both in our early thirties and on the utopian journey to a revolution that seemed not too far away. We were close friends and comrades through the excitement of ’68, and the pangs of its aftermath that Stuart resumed in his essay ‘The missed moment’. Our respective paths crossed many times mostly at and through the Centre where I was welcomed nearly every summer and then for over a year in 1974-75, in the moment of my abandonment of the Italian Communist Party that was becoming something else. From the mid-sixties onwards, there were Stuart’s and Catherine’s constant visits to Naples and the Orientale where he brought his intellectual insight, his revolutionary perspectives on knowledge and politics, his extraordinary oratorial gifts and his capacity to listen and communicate to our students, some of whom were quite eccentric and a bit out of their heads. His generosity in keeping the link between Naples and cultural studies never wavered: from being contested by the Maoists in those heady days to recent times, more tranquil alas, when his health made it difficult and his contribution even more generous. He came to speak, together with Catherine, on my retirement in 2006, and again in 2008 when the Orientale recognized his intellectual stature and critical militancy with a Laurea honoris causa, one of the many he had already received. Alongside the speech he gave on my retirement, I wish to remember the one he gave on a similar occasion for Avtar Brah that subsequently became a beautiful essay published in the Feminist Review issue on “Recalling. The scent of memory” (n.100, 2012). On both these occasions he spoke for our bodies of work and gave a close appreciation of it. As Nirmal Puwar has already said, Stuart’s support and siding with women’s causes and thought was very important to what feminists had already been doing and would be doing since. Alongside all this there were the many holidays Iain and I spent together with him, Catherine, Becky and Jess around the Mediterranean, and the one in Jamaica when he offered us unforgettable days in Kingston. Their children were growing up and so were we through our intellectual links and an enduring friendship. Stuart was a perfect fellow traveller, loved laughter, companionship and dance. Yes he was a great dancer, too. Iain Chambers teaches Cultural, Postcolonial and Mediterranean studies at the University of Naples. He studied with Stuart Hall at the Centre for Contemporary Cultural Studies and is the author of many books including Urban Rhythms (1985), Migrancy, Culture, Identity (1994) and Mediterranean Crossings. The Politics of an Interrupted Modernity (2008). Lidia Curti formerly taught English and Feminist studies at the University of Naples, “Orientale” and is now Honorary Professor in the same institution. She is the author of Female Stories, Female Bodies (1998), La voce dell’altra (2006), and co-editor (with Iain Chambers) of The Postcolonial Question. Common skies, divided horizons (1996).